On 100 private acres, nestled between two boulders on a mountaintop this stunning house has endless views of the Hudson Valley that pour inside out. Published in books & magazines this homey masterpiece is ideal for families and all who seek a retreat. 2hrs from NY, 15 min from Hudson. 4 bedrooms, 3.5 baths, 3800sf + 2000sf surrounding deck above the tree tops, miles of trails. 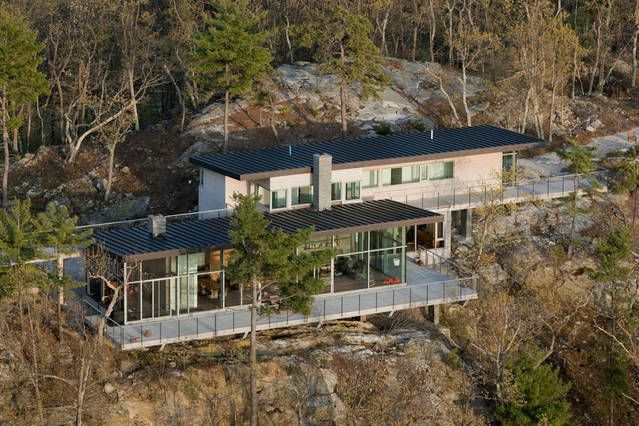 Built on a mountain top at treetop level and nestled between two boulders, this unique home has dramatic wide open views of the Hudson Valley and the Catskill mountain range. Vast 16 foot wall of windows surrounds the house and brings the outside in. You enter the house through the mud room which has a long stone bench and wood steps where people often take shoes off. The house is divided into two main areas: The Public Space and the second floor Living space. The main public space includes the living room with facing sofas and a huge hearth. This space flows into the kitchen with a large 18' foot work/eat Island and at the end of that is the dining room with a natural willow wood table that seats 8-12. On one end of this Public Space is the Media room with a TV and sofa (queen sleeper) and the guest room behind the media room has a queen bed and private bath with large "tea for two" bathtub. On the other end of the Public Space is the screened porch which is where we spend most of the summer nights with an outdoor fireplace. Outside there is a wide 2000sf deck that surrounds the whole Public Space. It is quite the experience to be outside on the deck in the vast views and where eye level is above the treetops. Upstairs there is a "landing" area that connects the two external bridges that lead outside to each of the two boulders. One Bridge leads to the viewing boulder and the other to the second boulder. The Viewing boulder is dramatic where you stand above a 40 foot drop and 360 degree views of the Hudson valley, the Catskill Mountains and the Berkshires. As a precaution we have red tape blocking off the area creating boundaries where young kids should ideally go only with adults. On this floor there are three bedrooms two kids rooms and the Masterbedroom. One of the kids room has a couple of queen futons on the carpet which often sleeps 6 kids. This room has views of the Berkshires. The other kids room has a queen bed. There is a bathroom between these two kid rooms. At the end of the upstairs space is the Masterbedroom (built into the rock) with a king bed and wall of windows facing south (and great big curtains to close for those wanting to manage the light). A door opens up to the upstairs terrace and hot tub area. The Masterbedroom has a large bathroom with stone shower and a large "tea for two" bathtub. In the back of the house there is a lawn and yard with a wood dining table, Adirondack chairs, and outdoor fun. Guest have access to the activities around in the hundred acres. There is a 16' trampoline, a zip line built between two trees, the worlds longest swing (so we think), and miles of trails. We live in New York City, both working professionals with two daughters ages 12 and 17. I am also a professor of at NYU. This is a getaway country house where we balance the city living. We built this house with love and attention and continue to nurture it on an ongoing basis. The house itself is designed as a bridge connecting two boulders. The Viewing boulder is dramatic where you stand above a 40 foot cliff and 360 degree views of the Hudson valley, the Catskill Mountains and the Berkshires. There is nothing quite like it. There is something magical about the place. Everyone who comes here instantly shifts into retreat relax mode. Sometimes there are discussions about should we do this or go there yet no one goes anywhere as everything is so comfy ideal. 3 full bathrooms with "tea for two" large bathtubs. Master also has oversized pebblestone shower. Yes we have AC throughout the whole house yet rarely use it because of the breeze onto of the mountain. Heated floors and forced air throughout the house. The pantry is stocked. It is assumed you will bring your own food and can use the home spices, olive oil, etc or if you run out of something. Catamount resort is 12 minutes away and Hunter is 30 minutes. We had an excellent time here. The house and view is beautiful and the place is a perfect spot to relax with the family. I needed a secluded place to write and get some work done and this was great. Only a few minutes to the train station and restaurants in Hudson and Copake. Unparalleled views.